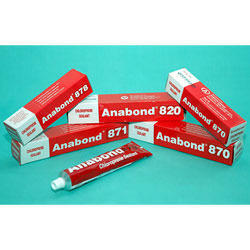 Anabond Rubber Based Adhesives are widely used for bonding, sealing, gasketting and insulation applications. 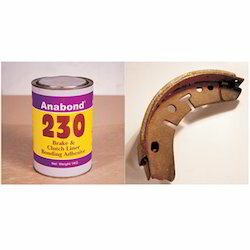 Anabond 230 is a synthetic resin based adhesive, designed specially for bonding friction lining material in Brake Shoes and Clutch. Anabond 230 has exceptionally high strength to withstand very high shear loads prevalent between liner and brake shoes / clutch plates. The strength is retained at very high temperatures, so that the lining is bonded firmly even under severe working conditions. Bonding of friction linings instead of fastening eliminates scouring of the drum created by rivet heads, used for fastening the liner. The load is uniformly distributed throughout the bonded area instead of stress concentration at riveted joints. Anabond 696 is a polychloroprene rubber based solvent containing sealant / adhesive system capable of bonding different substrates such as glass, painted metals, vulcanized poly chloroprene rubber, poly propylene, Leather, Rexin etc. This adhesive / sealant system develops a high degree of handling strength immediately after bonding and the joint strength increases further with more curing time. Because of higher bond strength developed immediately after mating the substrates, the assembled components can undergo further operation without clamping or fixing. The chemical and moisture resistance of this adhesive / sealant systems is generally sufficient to permit use in any exterior or interior application in the building and construction, automotive and footwear industries. 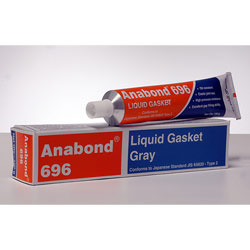 Anabond 870 and other series of rubber based adhesive is a single component chloroprene sealant, which exhibits excellent adhesion to most substrates including glass, rubber and painted metal. It cures by solvent evaporation into a tough flexible rubber. The product totally prevents ingress of moisture. This product finds use in bonding voice coil to cone paper, frame to damper, speaker assembly to cabinet, sealing of pipe joints in washing machines, bonding of foams etc. Wood, Rubber, Cardboard, Leather, Foams, Metals, Plastic, Stone, etc. Non Curing Butyl Mastic Putty and Tape are non-curing butyl rubber based tacky tape for insulating and weather proofing sealing compound. Once applied Non Curing Butyl Mastic Putty and Tape will not dry out, soften or become hard or brittle. It retains its original elasticity. This product shows good adhesion properties with PVC, XLPE and rubber cable insulation. This product is easy to lay without use of any applicator as such does not involve any wastage.Non Curing Butyl Mastic Putty and Tape exhibits good water proofing property and provides safe and durable joint. 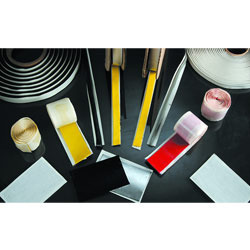 Looking for Rubber Based Adhesives ?